High in the mountains of war-torn Tajikistan, rebels abduct inspirational UN peace negotiator, Rahul Khan. The lives of his closest friends begin to unravel. Tessa, now married with two children, has never stopped loving Rahul. Lance, a dedicated aid worker, has used Rahul’s friendship to avoid facing up to the gaps in his own life. Hugo, his UN supervisor, feels responsible for the abduction and is driven to uncover the truth. Tajik translator Nargis owes Rahul a personal debt but has secrets she cannot share. As hopes for Rahul’s survival fade, each must find a way to begin again. 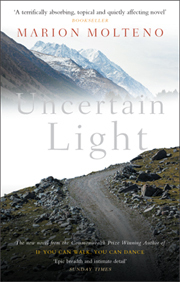 I just finished Uncertain Light and was moved by the story. The characters were like old friends and though I liked the ending I was sad to leave them. It is an unfinished story as so many lives are touched by NGO workers in our splintered world. I have always wondered what it is like for those people who live and work in such dangerous and difficult places. How hard it must be to have normal lives with families of their own. Brenda Aronowitz sent me this book, a good friend from our California days. She worked with my husband at the York school in Monterey. I am grateful that she passed on your novel.